Nitidus are now featured on the V-Raw website. Check it out at http://www.myspace.com/vraw. Thanks V-Raw! 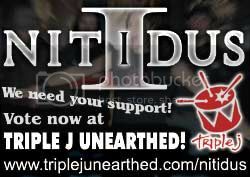 Tonight, Nitidus have released their first new song in over two years! Head over to Myspace and listen to 21 Alibis, the title song from our recent US tour. 21 Alibis is one of several demo tracks that were recorded in Marki’s mobile studio sporadically since January this year. Most of you who have been to see our rock shows this year will no doubt recognise the song. 21 Alibis highlights a new groove-rock style that the band has been creating in its current line-up. We feel it is the next evolution of the Nitidus sound and hope you enjoy this first taste. It’s been almost two years since we shared all four full tracks from the Still Here EP on Myspace. Initially intended to be a limited-time offer, the tracks proved to be quite popular and had stayed ever since. Now that we’re back from the States and have some new demos completed, we figured it was about time to share some new sounds with you guys. Keep an eye out, there’s more of the good stuff on the way. Spread the word.